*note: before we moved into my condo, as we were moving out of dw’s apartment he introduced me to a Trinidadian restaurant around the corner. i was pissed. because the food’s amazing and it’s within walking distance and he’d never taken me before. 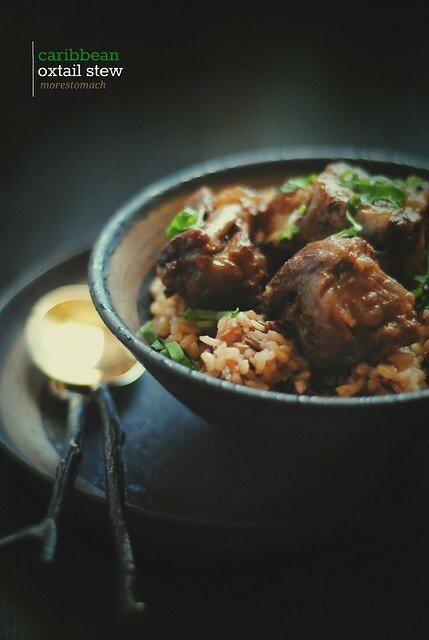 we haven’t been back in a long time, this is very similar to a trinidadian oxtail stew. 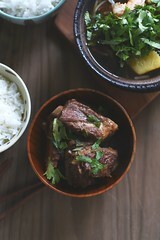 *call around to your local butchers or favorite grocer to see if they have fresh oxtail, grassfed being the best. *this is a fatty dish, have a salad on the side to cut through the richness. then run a mile or so. *the original dish calls for carrots, brown sugar and Worcestershire sauce, ingredients we had every intention of adding in the last hour or so. but we forgot. we were busy watching the Following. 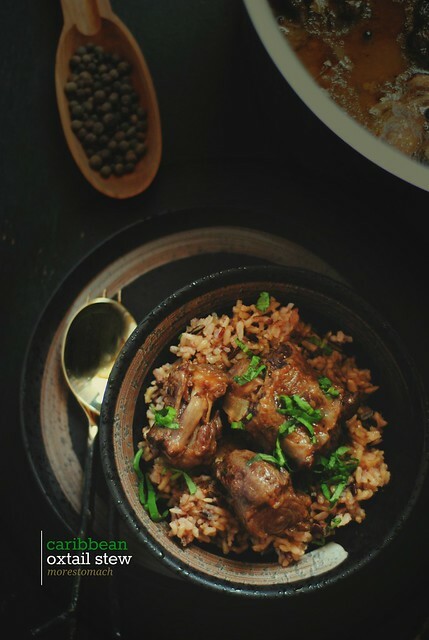 in a dutch oven or heavy bottomed pot, over medium high heat, heat up the oil and brown the oxtail to your heart’s content. go for a deep color. transfer to plate, ignore. into the pot add the tomato paste, ginger, onions and celery, saute until soft. add in the flour and stir until smooth. just make sure the flour’s all gone. add the oxtail in again, along with the stock, allspice, thyme and chiles. bring to a broil, then reduce heat to low, cook for about 3 hours. i may have let it go for 4 hours, until meat is tender and falling off the bone. check seasoning. This stew…wow!! It’s time for me to branch out beyond canned chicken noodle soup. That looks like one rich stew! I have not had oxtail before. Will ask the butcher next time in the grocery store. It makes me mad to discover good places at the last hours of my presence in that city or neighborhood too. Hope you guys make it back time to time. ilke, i did have to tweet and call a couple of grocery stores in the area to track down the oxtail. it was worth it. I’ve been waiting for this recipe since I saw you post it on IG a little while back! It looks so savory and warming .. perfect for Christmas. I also love leftover stew — is it just me, or do they seem to taste even better on the second go-round? Even after freezing! Love your resolutions. We keep wimping out on the dinner parties too.. sigh. i completely agree that the next day is always better. we actually made this stew the day before we ate it, i planned to have it cook all day and then prior to reheating it day of, i skimmed as much of the fat off the top as i could. it’s all about planning girl. We have been watching the Following, too!!! I love your resolutions. As a rule I try not to make any for myself. But yours are most excellent. I would like to read more, too! As far as the dinner party, I believe in you. Our dinner party on Saturday night was so many bodies in the apartment that some of us did eat from plates on the floor. I dont think anyone minded. 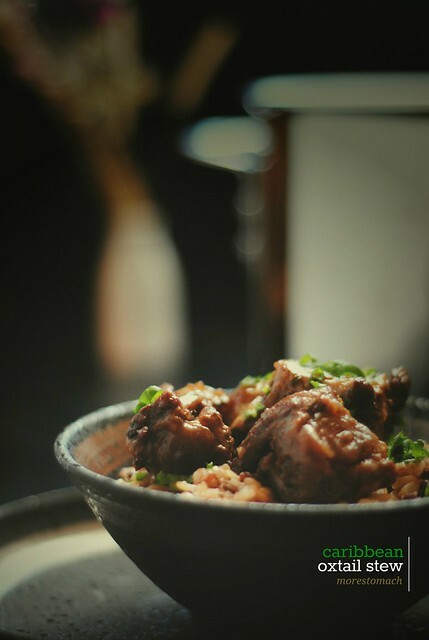 If you’re serving food like this here oxtail — NO ONE will care how they get it into their mouths. How good does this sound! Cheers! sophie! are you pooping your pants over the show or what? it’s FREAKING ME OUT. One thing about the show is that I am now suspicious of EVERYONE. amanda, you are so KIND. thank you. This looks delish. Thanks for sharing. And I totally admire the simplicity of your new year’s resolutions. I started contemplating mine ridiculously early this morning over a cup of tea and my journal and they came out reading something like: figure out my life. lose a hundred thousand pounds. spend 8 hours a day with my daughter, 8 being super fantastic at my dream job, 4 with my husband being amazing and wifely, 3 hours blogging, 5 hours training to become an Ironman champ, and 2.5 becoming a yoga guru. I might have to narrow things down a little.